What's not to like? 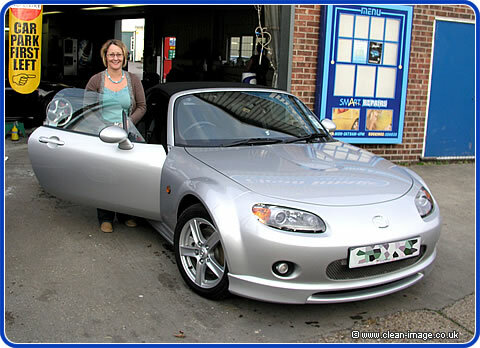 It's an MX5! They are superb cars and this one was owned by a bubbly lady who's hair colour matched here car. The two just seemed made for each other. I have a bit of a passion for 1960's sports cars, and I think that the MX5 is the only modern production car that really captures that 60s spirit, both in looks and the way the car drives. Yet it's Japanese so you don't have all the reliability issues that you get with classic cars. We are big fans of the MX5, and I thought this red hardtop was a particually nice example. The car origionally came to us a few weeks back, Gary did an appraisal on the car and refered it on to J&M Rice Body Works to have some panels repainted. The car then came back to us for a Silver Valet and a few dents to be removed. The car also had a body buff and because she had to wait for the paintwork to be done, this lady was able to take advantage of our advanced booking offer. Before the actual valet all the services available were explained in detail and there was absolutely no pressure at any stage of the assesment. I had never driven one of these before, and I only drove it across the workshop but I could feel as soon as I got in that the car just feels right. It will be a hard push to beat the MkII MX5 (above) but I'd really like to take one of these new MX5s for a test drive. This lady called us because a tree had dropped sap onto her new car, her husband had come in to us for the same problem about a year ago and this resulted in having the familys cars treated with Supagard. Having a paint sealant means it was a lot easier for us to remove the tree sap and we treated this job as a emergency, the car was with us within an hour of us getting the call and we had the car back to the way it should be in 45 mins. The result was a very happy customer.